Oh, Wow! these are gorgeous Susie. 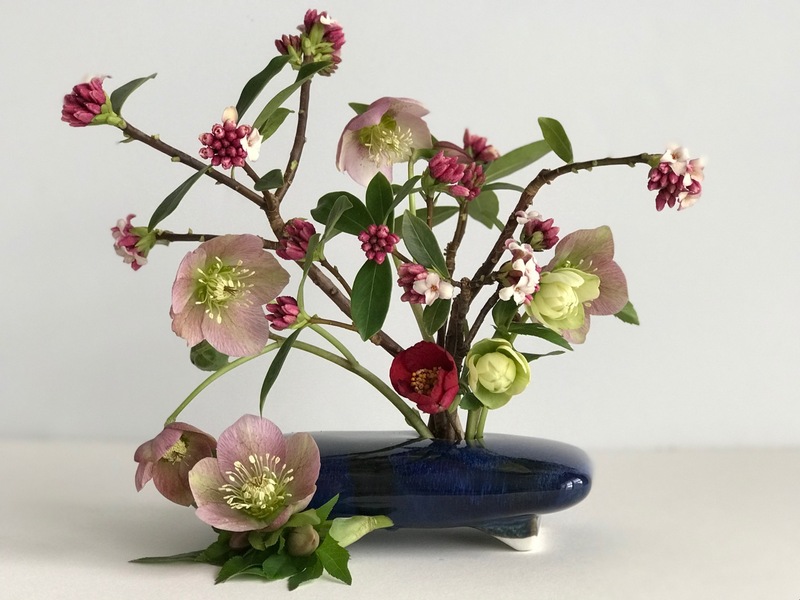 I love the elegance of the Ikebana arrangement but the other simple bowl of blooms is stunning too. Both are perfect. Thank you. I was startled at how easily the second vase came together. 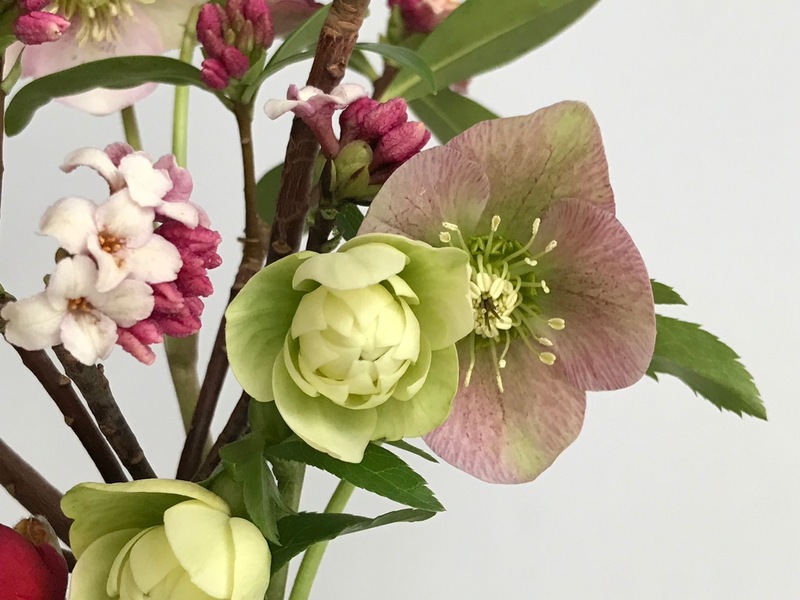 I’ve become a big fan of hellebores, although I don’t have too many different ones. It’s nice to be on this side of winter, with anticipation each week of bountiful blooms. Our winter has been so much colder than usual, it doesn’t feel spring like at all. I love, love, love these beautiful arrangement. And the first one in the blue vase just has a very zen feel to it! 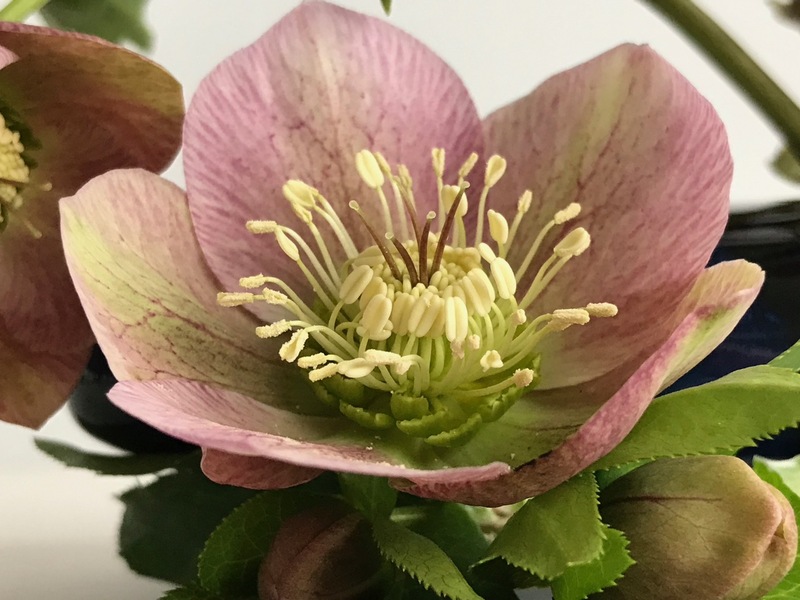 Hellebores is one of those plants that I eventually need to grow. Here in Minnesota is just so conflicting starting plants from seeds because our winter/spring are so unreliable weather wise. Yours are beautiful. Thanks. 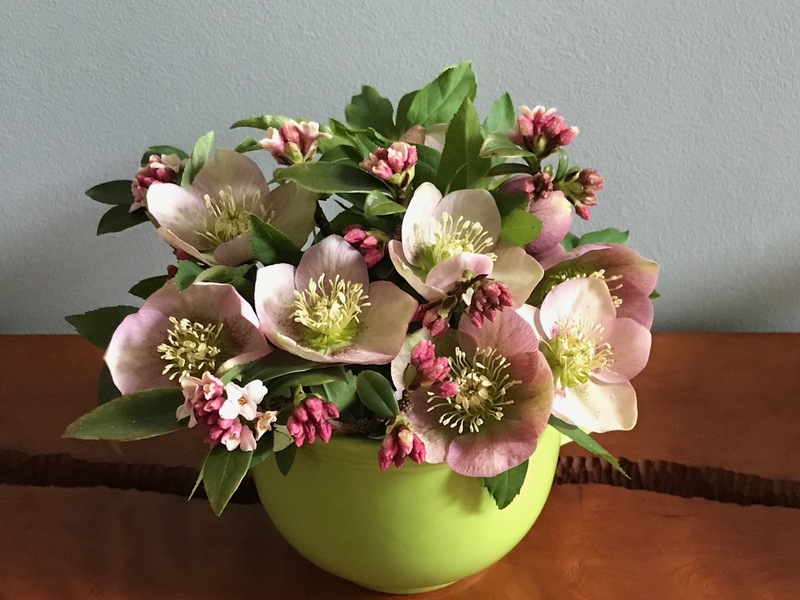 I appreciate Hellebores more and more each year. They can be expensive to purchase but find a fellow gardener to share some with you. Both vases are so creative and beautiful. Thanks so much. It’s great to know we’re heading into more and more flowers every week now! Both groupings are lovely. 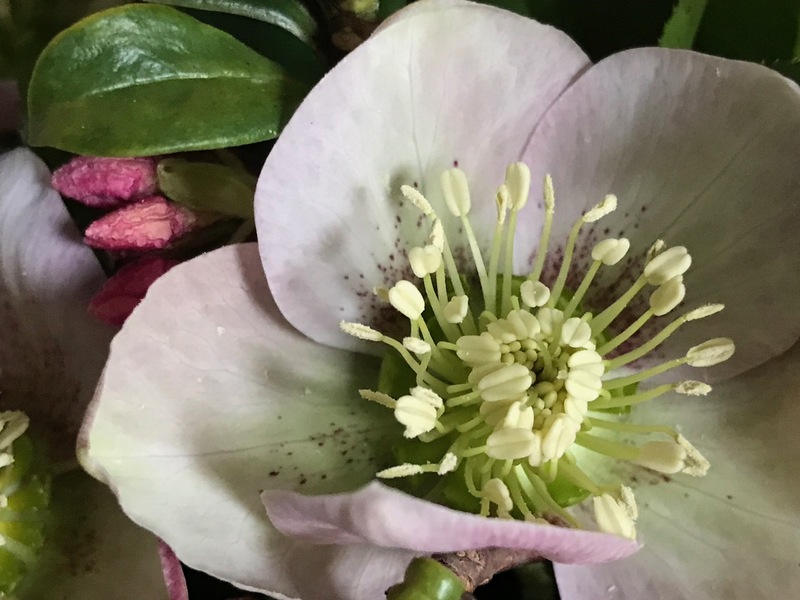 And what a joy to have Hellebores, let alone your other flowers, at this time of year. Mine won’t open until March or later. Early for us as far as most plants go, but I am already counting the days. Linda, thank you. Since starting this garden in 2001 I’ve been surprised at how early a few key plants come into flower here. March will be a happy time for you. Oh, how funny. I would not have thought of daphne as a cut flower. We grew it on the farm. The flowers were an unwanted byproduct that needed to be plucked off to promote more vegetative sideshoots for cuttings. I sort of felt badly about plucking them, so collected them in a bucket, and dumped them in shallow bowls around the house for their fragrance. It was sort of like floating camellia flowers, but without the water. They were quite pleasantly fragrant for days, but eventually started to smell like moldy oranges. Thanks for the tip. 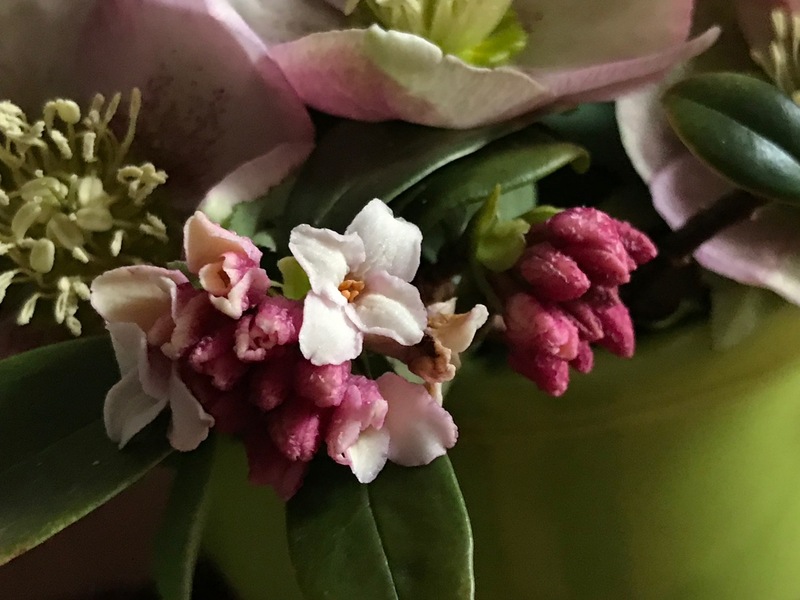 I’ll toss the daphne before the moldy orange smell kicks in. Oh, I did not mean that as a tip. They only smelled like moldy oranges because they were piled into bowls. They would not do that on a stem. Your creative talent with flowers always inspires me, Susie. I love the way your arrangements are so well thought out and executed as I’m more of a throw-a-bunch-of-stuff-in-a-container-and-hope type. Both arrangements are beautiful. Thanks. Peter, yours always seem quite well constructed and you have so many interesting vases and props to build from. It’s fun we get to share flowers each Monday. Well, if you lived closer I’d drop it by for you to enjoy Cathy. The creamy double is taking its time maturing, so I don’t expect many blooms from it. Couldn’t wait though for it to happen. I love the color combination here, Susie, and of course it goes without saying that you’ve done another masterful job in arranging the blooms. I had a Daphne odora in my former garden and, despite the challenges I face in this garden, I’m tempted to try growing it again as I’d like more scent in the garden. (Rain here is once again prompting the delusion that growing nearly anything is possible.) I was also encouraged to read that it took a few years for your hellebores to bloom. Thus far, I’ve only got 2 plants that bloom reliably but maybe there’s hope for the others I’ve planted too. Best wishes! Thanks so much Kris. I was instructed to not give Daphne too much water, so maybe you would be ok to try it. Scrumptious or sumptuous or both. And so Japanese. 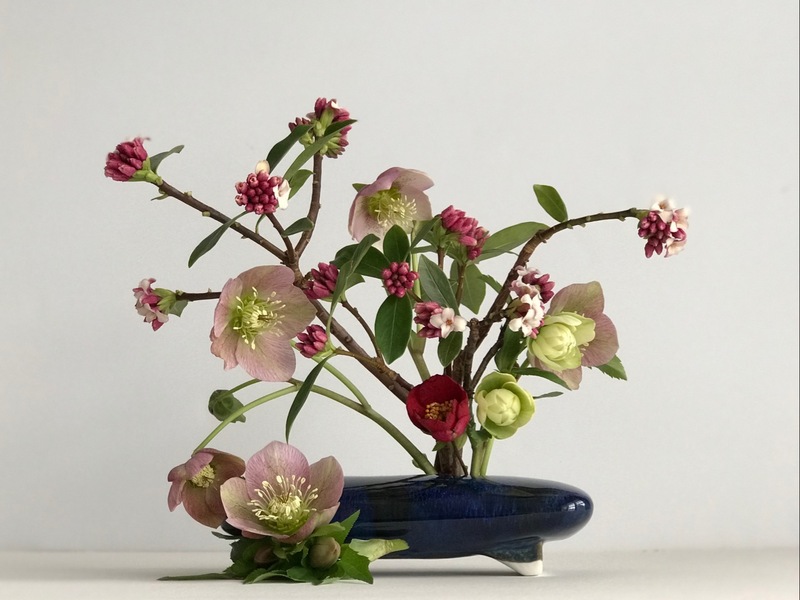 I’m impressed (but not surprised) that you could tease those Hellebores into such lovely arrangements. Thanks for your confidence in me Ricki! These were unusually cooperative. Normally unless you float the hellebores they’re difficult to work with I find. Take good care! Your first arrangement is gorgeous! I love daphne and can imagine its soft scent. 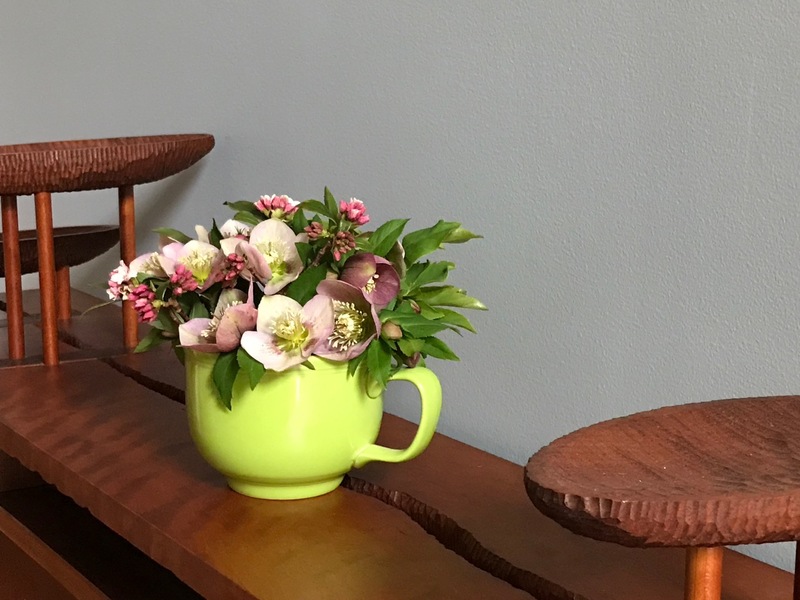 The second vase is a delight as well – so many hellebores to cut! Lovely! Thanks Cathy. Isn’t daphne a treat? Are you able to grow it in Germany? Both of them are stunning Susie. I love that black Ikebana vase. Thanks I like the vase too—it adapts to whatever is available to place into it. Very nice! 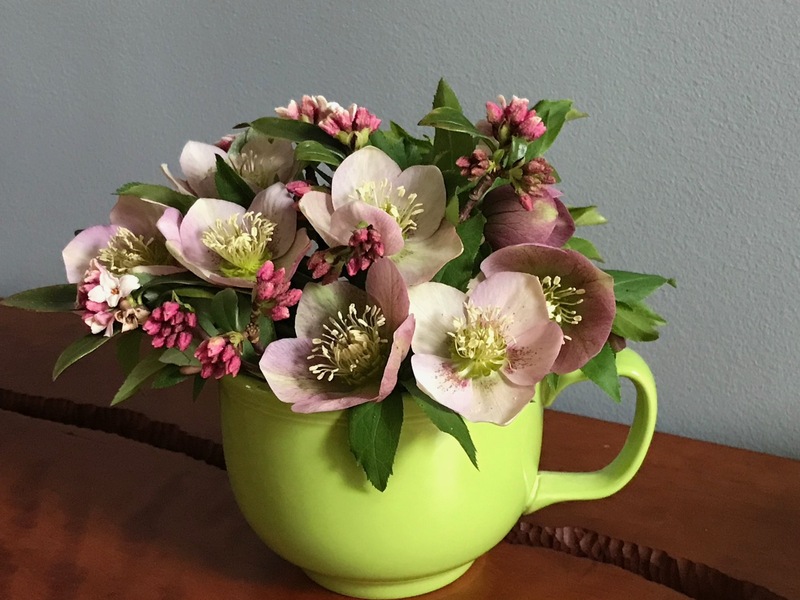 I didn’t know that Hellebores made good cut flowers. Thanks. 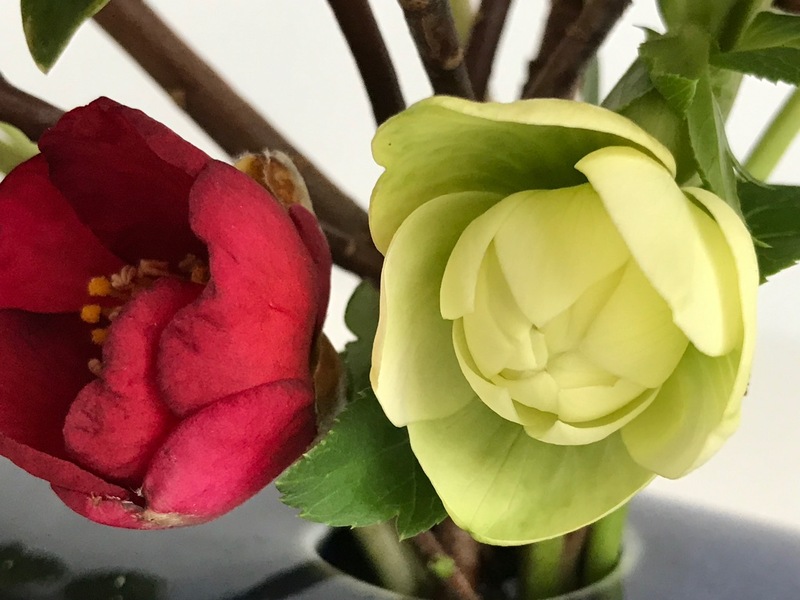 The hellebores don’t hold up very well and after 2 days are beginning to fade. It’s easier to keep them if you pick mature flowers and float them in a bowl of water. They lasted long enough to enjoy though.